We introduce a new notion called a quasi-Feistel cipher, which is a generalization of the Feistel cipher, and contains the Lai–Massey cipher as an instance. We show that most of the works on the Feistel cipher can be naturally extended to the quasi-Feistel cipher. 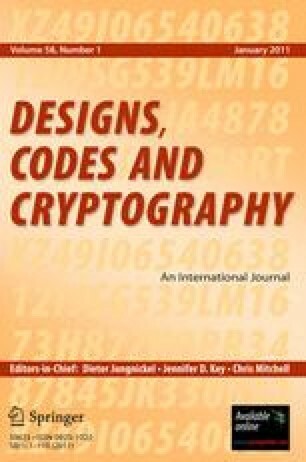 From this, we give a new proof for Vaudenay’s theorems on the security of the Lai–Massey cipher, and also we introduce for Lai–Massey a new construction of pseudorandom permutation, analoguous to the construction of Naor–Reingold using pairwise independent permutations. Also, we prove the birthday security of (2b−1)- and (3b−2)-round unbalanced quasi-Feistel ciphers with b branches against CPA and CPCA attacks, respectively. Communicated by S. D. Galbraith. This work was done while the first author was at the Electronics and Telecommunications Research Institute.